Click the button below to add the KTM- 950 Kaneg Centre Lift Mate NT & WA DELIVERY INCLUDED to your wish list. Centre lift dolly Motorcycle stand/ moving stand/Motorbike central stand/paddock stand. The KANEG Centre Lift is not only functional but it's a great looking piece of kit, go on impress your mates and showcase your passion. The compact construction maximises the available floor space, so more Toys per meter a great compromise. With your Bike on the stand you can complete almost any job and is the best assist when making suspension changes. A must where your garage has a limited space as the KCLS can manoeuvre your ride into a tight space. Since 2006 Kaneg has been proudly serving the Motorcycle Racer, Rider and Enthusiast alike. For other products visit our website: kaneg motorcycle accessories. Is a knockdown frame system for easy transportation. Adjustable height to a maximum 150mm. Rubber floor bumper, for use on most hard surfaces. You shall need an Torque wrench, Allen key + ring spanner or socket + lock tight for rear stand hook bolts to complete the stand assembly. Only use these stands to support a motorcycle on a hard and level surface. Do not sit on the motorcycle whilst the bike is supported by any stand. Monthly check-tighten all bolts and nuts. After manufacturer and painting, each stand is factory assembled to ensure an accurate parts fitment, during this assembly the stand paint may be scratched. Paint scuffs, scratches and blemishes shall not be considered as a fault in manufacture. Weighting about 12kg, our Market proven Kaneg professional racing centre lift paddock stand has 4 wheels (1/leg) for added stability and manoeuvrability. Black Powder Coated frames with galvanised fittings our KCLS will give years of reliable service. For convenience our stands can easily be disassemble to take less space for transport. 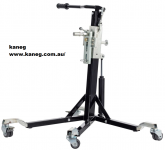 KANEG stands are quick and easy to assemble. Assembly instructions are available upon request.